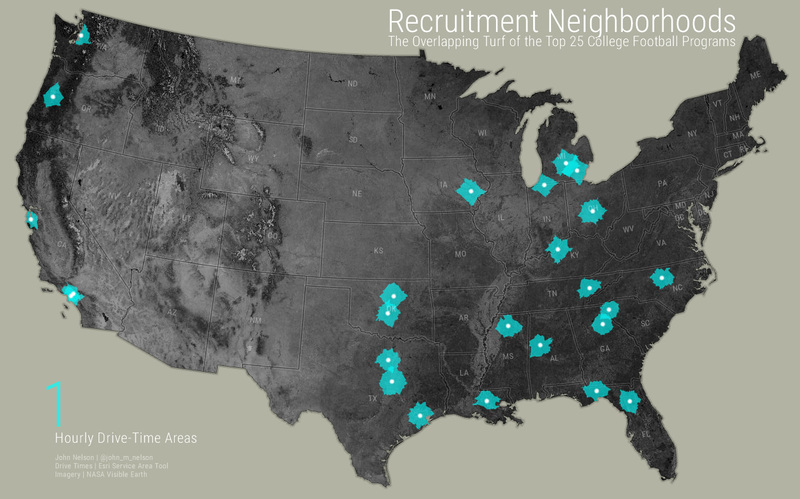 Because I already had the data, and I like cobbling together clunky animated GIFs, here is a little visualization of the local recruitment neighborhoods for the top 25 college football programs. 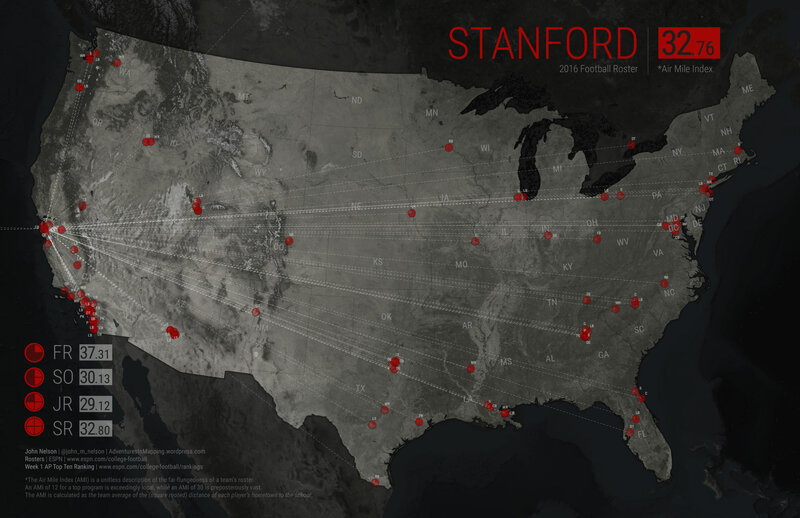 In some cases, these drive times mean very little, since teams like Stanford and Notre Dame don’t really recruit from local areas. But those don’t really tell me a whole lot; those drive-time areas pile up on each other really quickly. What I really want to know is where are the competitive boundaries of overlap? Here is a hexy-heatmap showing how much top-25 football school overlap is happening in a neighborhood. The faint cells overlap just two schools at the 5-hour distance. But the white hot cells indicate neighborhoods where there are many, nearby, schools. If you are a top-rated high school prospect in any of those high-density zones, expect some attention. Each drive-time rign was given a weighting, decreasing as you get farther away. Then, a hexagonal mesh was draped over the country, and drive-times were added up underneath each hex. This same drape hex dots over lots of polygon blobs and count the hits method was used to make this drought map. There’s a bit of a trick to it. You use a “spatial join” maybe for the first time in your life. Here is the source shapefile (5.8mb) of the drive-times, if you are into that sort of thing. 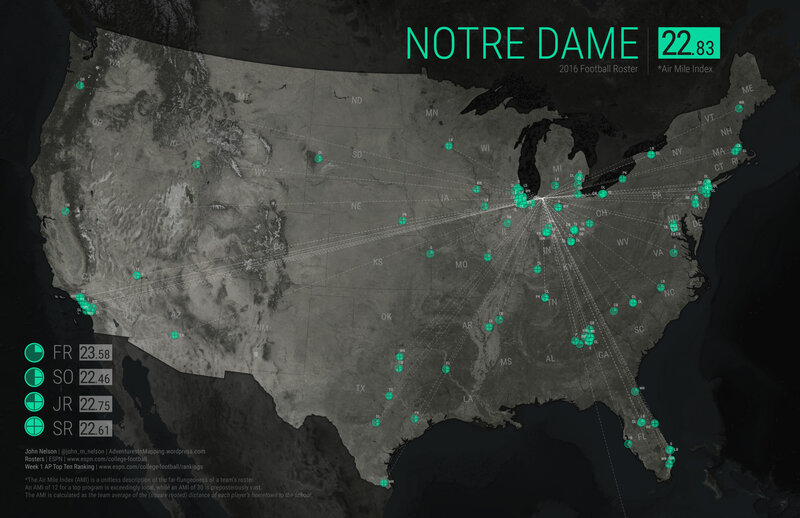 They were generated using the Esri Service Area tool. Here is the source shapefile (80kb) of the recruitment-overlap hexagons, used to make the heatmap.